IS SITUATED IN THE CENTER OF THE HIGHLANDS , THE HIGHVELD. 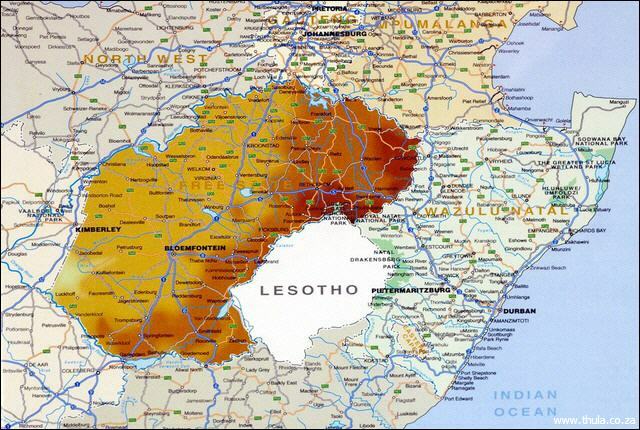 THE FREESTATE IS BORDERED FROM NATAL, LESOTHO, KAPPROVINZ AND THE TRANSVAAL. THE MAIN PART OF THE FREESTATE IS FLAT AND IS MAINLY USED FOR AGRICULTURE AND FARMING. THE FREESTATE IS ALSO RICH IN MINERAL WEALTH. ARE HIGH ENOUGH TO HAVE SNOW IN THE WINTER. SOME PEOPLE EVEN TALK OF "LITTLE SWITZERLAND"
THE SOUTH OF THE FREESTATE AND THE AREA AROUND THE ORANGE RIVER IS A PARADISE FOR FISHING AND TRACKING. THE VAAL RIVER IS ALSO IDEAL FOR FISHING. PARA-GLIDING, ULTRA LIGHT FLIGHTS AND SPORTS SHOOTING. THE "WILLEM PRETORIUS GAME RESERVE"
THE "GOLDEN GATE HIGHLANDS NATIONAL PARK"